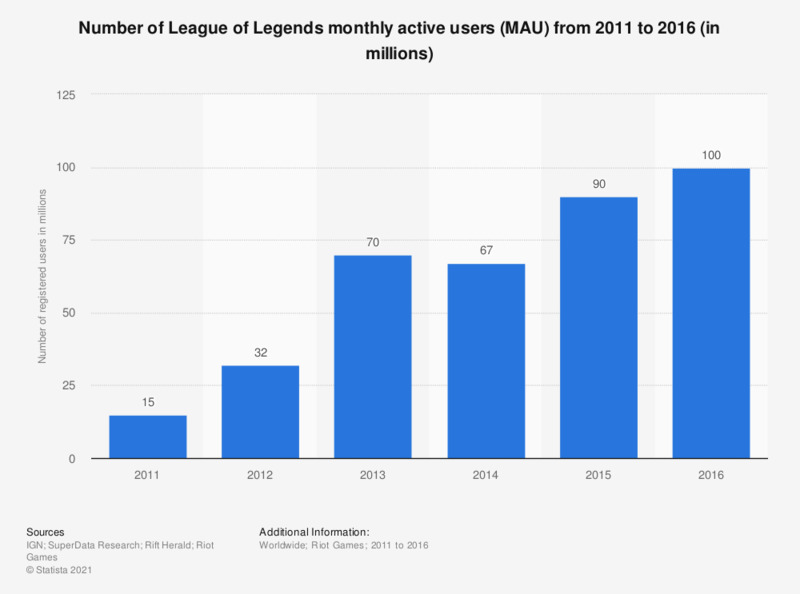 This statistic illustrates the number of League of Legends (LoL) monthly active users worldwide from 2011 to 2016. In 2016, LoL had 100 million MAU, up from 90 million in 2015. Being one of the most prominent eSports games, in 2015 LoL championship finals attracted 36 million viewers worldwide. What is more, with the rise of gaming video content popularity, video games enthusiasts can now watch other players try their chances in the game, from the comfort of their own home. And so, League of Legends was one of the top games on Twitch, based on the number of hours viewed in 2016. It comes a no surprise that LoL held the highest share of the MOBA games revenues that year. Figures other than for 2016 come from different press releases.